Noram Completes Promising First 7 Drill Holes On Zeus Property, Clayton Valley | Noram Ventures Inc.
Vancouver, British Columbia – December 5, 2018 – Noram Ventures Inc. (“Noram”) (TSX - Venture: NRM / Frankfurt: N7R / OTCBB: NRVTF) is pleased to provide an update on the Phase III drill program on Noram’s flagship Zeus property in the Clayton Valley, Nevada, USA. The first Noram Ventures Phase III core hole, CVZ-45, was completed on November 19, 2018 at the planned depth of 100 feet (30.5 meters). The hole was located approximately 1150 feet (350 meters) northwest of the previously announced 43-101 compliant inferred resource of 17 million tonnes at a grade of 1060 ppm Li. The complete NI 43-101 Technical Report is available on SEDAR. The core has been logged and sampled and the samples have been shipped to ALS Laboratories in Reno, Nevada, USA for analysis. The geologic log shows that the top 85 feet (26 meters) of the hole contained olive green claystone and mudstone very similar to that seen in holes within the resource area. The bottom 15 feet (4.6 meters) contained gray, green and brown limestone, sand and conglomerate along with some mudstone. CVZ-45 may well be deepened at a later time to determine the significance of the sandy, conglomeratic layers in the lower part of this hole. At present, 7 drill holes of the intended 17 have been completed to a depth of approximately 100ft. As indicated in the map below, all 7 holes, (CVZ-45 through CVZ-51), were drilled to the north-east of the resource area other than CVZ-51. 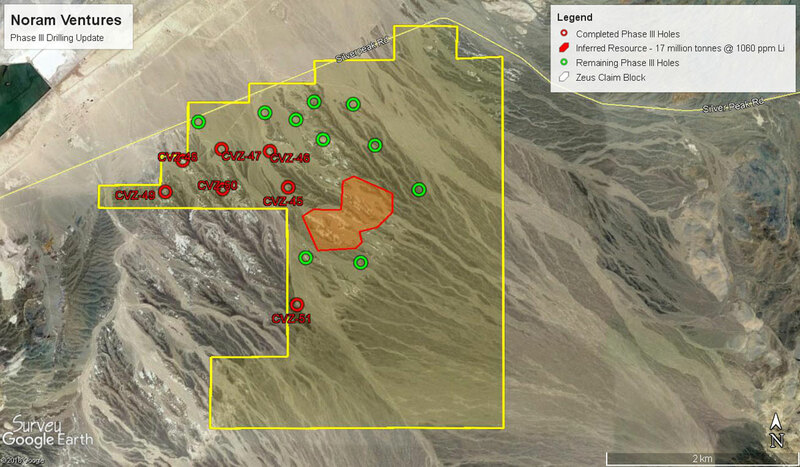 All holes completed to date, with the exception of CVZ-49, have intersected green mudstones and claystones and, in some cases, the chemically reduced blue and black claystones reported by Cypress Development on their adjacent property. Noram is moving forward aggressively with this program. Drill teams are currently operating 24 hours a day in two shifts with the expectation of completing the Phase III program in the next 7-10 days. Samples are being shipped to ALS Labs in Reno as drilling progresses. The Company anticipates the turn around of the first core assay results in the near future. Phase III Drill Program. 7 holes completed to date (red) and the remaining 10 holes to be drilled (green). The current inferred resource area referred to in the NI 43-101 Technical Report (orange). The technical information contained in this news release has been reviewed and approved by Bradley C. Peek MSc. and Certified Professional Geologist who is a Qualified Person with respect to Noram’s Clayton Valley Lithium Project as defined under National Instrument 43-101. Noram Ventures Inc. (TSX - Venture: NRM / Frankfurt: N7R / OTCBB: NRVTF) is a Canadian based junior exploration company, with a goal of developing lithium deposits and becoming a low - cost supplier for the burgeoning lithium industry. The Company’s primary business focus since formation has been the exploration of mineral projects. Noram’s long term strategy is to build a multi-national lithium minerals company to produce and sell lithium into the markets of Europe, North America and Asia.